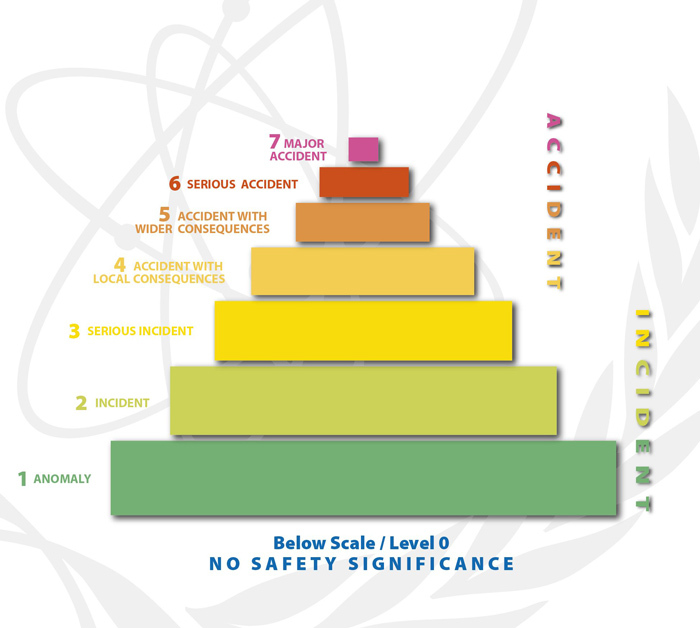 The International Nuclear and Radiological Event Scale is a worldwide tool for communicating to the public in an open and consistent way the safety significance of nuclear and radiological events. The scale was designed by an international group of experts convened in 1989 jointly by the IAEA and the Nuclear Energy Agency of the Organization for Economic Co-operation and Development (OECD/NEA). Since then, the IAEA has managed its development in cooperation with the OECD/NEA and with the support of more than 90 designated INES National Officers that officially represent the 74 countries in discussions and development of the scale. INES applies to any event associated with the transport, storage and use of radioactive material and radiation sources whether or not the event occurs at a facility. It covers a wide spectrum of practices, including use of radiation sources in medicine and industry, activity at nuclear facilities, and transport of radioactive material. It also includes the loss or theft of radioactive sources or packages and the discovery of orphan sources, such as sources inadvertently transferred into the scrap metal trade. When a device is used for medical purposes (e.g., radiodiagnosis or radiotherapy), INES is used for the rating of events resulting in actual exposure of workers and the public, or involving degradation of the device or deficiencies in the safety provisions. Currently, the scale does not cover the actual or potential consequences for patients exposed as part of a medical procedure. 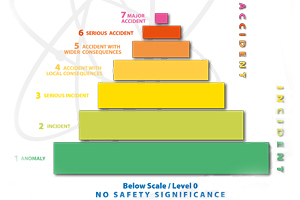 The scale is only intended for use in civil applications and only relates to the safety aspects of an event. Currently, 74 IAEA Member States participate in INES and use the scale to communicate the safety significance of events to the media, the public and the technical community through NEWS. For further information on INES, please see the INES Leaflet, the INES Manual or contact the INES co-ordinator at the IAEA.